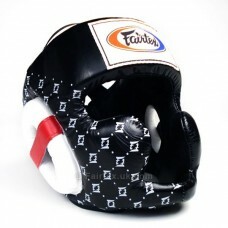 Comprehensive coverage to help prevent injury with ears, cheeks and chin protection. Feature more padding on forehead, cheek and back strap while maintaining nice and clear vision. Feature more curve on chin protector to comfort your throat and added wind shield on ear protector for more safety and simulate real fight amateur competition. Soft inside but hard outside for maximum comfort. Special multi-layered high-density foam core for maximum protection and shock absorbent.